Anandamayi Ma (née Nirmala Sundari; 30 April 1896 – 27 August 1982) was an Indian Hindu spiritual leader, described by Sivananda Saraswati (of the Divine Life Society) as "the most perfect flower the Indian soil has produced." Precognition, faith healing and miracles were attributed to her by her followers. Paramahansa Yogananda translates the Sanskrit epithet Anandamayi as "Joy-permeated" in English. This name was given to her by her devotees in the 1920s to describe her perpetual state of divine joy. 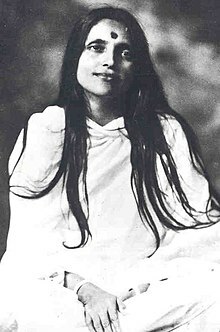 Anandamayi was born Nirmala Sundari Devi (নির্মলা সুন্দরী; Nirmôla Shundori, English: "Immaculate, Beautiful Goddess") on 30 April 1896 to the orthodox Vaishnava Brahmin couple Bipinbihari Bhattacharya and Mokshada Sundari Devi in the village of Kheora, Brahmanbaria District, now in present day Bangladesh. Her father, originally from Vidyakut in Tripura, was a Vaishnavite singer known for his intense devotion. Both parents were from well regarded lineages, though the family lived in poverty. Nirmala attended a village school for approximately two years. Although her teachers were pleased with her ability, her mother worried about her daughter's mental development because of her constantly indifferent and happy demeanor. When her mother once fell seriously ill, relatives too remarked with puzzlement about the child remaining apparently unaffected. In 1908 at the age of thirteen, in keeping with the rural custom at the time, she was married to Ramani Mohan Chakrabarti of Vikramapura, whom she would later rename Bholanath. She spent five years after her marriage at her brother-in-law's home, attending to housework in a withdrawn meditative state much of the time. It was here that a devout neighbor Harakumar, who was widely considered insane, recognised and announced her spiritual eminence, developed a habit of addressing her as "Ma", and prostrated before her morning and evening in reverence. When Nirmala was about seventeen, she went to live with her husband who was working in the town of Ashtagram. In 1918, they moved to Bajitpur, where she stayed until 1924. It was a celibate marriage—whenever thoughts of lust occurred to Ramani, Nirmala's body would take on the qualities of death. On the full moon night of August 1922, at midnight, twenty-six-year-old Nirmala enacted her own spiritual initiation. She explained that the ceremony and its rites were being revealed to her spontaneously as and when they were called for. Although uneducated on the matter, the complex rites corresponded to those of traditional, ancient Hinduism, including the offerings of flowers, the mystical diagrams (yantras) and the fire ceremony (yagna). She later stated, "As the master (guru) I revealed the mantra; as the disciple (shishya) I accepted it and started to recite it." Nirmala moved to Shahbag with her husband in 1924, where he had been appointed as the caretaker of the gardens of the Nawab of Dhaka. During this period Nirmala went into ecstasies at public kirtans. Jyotiscandra Ray, known as "Bhaiji," was an early and close disciple. He was the first to suggest that Nirmala be called Anandamayi Ma, meaning "Joy Permeated Mother", or "Bliss Permeated Mother". He was chiefly responsible for the first ashram built for Anandamayi Ma in 1929 at Ramna, within the precinct of the Ramna Kali Mandir. In 1926, she reinstated a formerly abandoned ancient Kali temple in the Siddheshwari area. During the time in Shahbag, more and more people began to be drawn to what they saw to be a living embodiment of the divine. From this point onwards various scholars were drawn to Anandamayi Ma's spirituality and teaching, though she continued to describe herself as "a little unlettered child". Mahamahopadhyay Gopinath Kaviraj, Sanskrit scholar, philosopher, and principal of Government Sanskrit College in Varanasi and Triguna Sen were among her early followers. Uday Shankar, the famous dance artist, was impressed by Anandamayi Ma's analysis of dance, which she used as a metaphor for the relationship between people and God. She was a contemporary of the well known Hindu saints like Udiya Baba and Paramahansa Yogananda. Ma died on 27 August 1982 in Dehradun, and subsequently on 29 August 1982 a Samadhi (shrine) was built in the courtyard of her Kankhal ashram, situated in Haridwar in North India. Anandamayi Ma never prepared discourses, wrote down, or revised what she had said. People had difficulty transcribing her often informal talks because of their conversational speed. Further the Bengali manner of alliterative wordplay was often lost in translation. However a devotee, Brahmachari Kamal Bhattacharjee, made attempts to transcribe her speech before audio recording equipment became widely available in India. A central theme of her teaching is "the supreme calling of every human being is to aspire to self realization. All other obligations are secondary" and "only actions that kindle man's divine nature are worthy of the name of actions". However she did not advise everyone to become a renunciate. She would dismiss spiritual arguments and controversies by stating that "Everyone is right from his own standpoint,". She did not give formal initiations and refused to be called a guru, as she maintained that "all paths are my paths" and "I have no particular path". She did not advocate the same spiritual methods for all: "How can one impose limitations on the infinite by declaring this is the only path—and, why should there be so many different religions and sects? Because through every one of them He gives Himself to Himself, so that each person may advance according to his inborn nature." She herself has said (ref. Mother Reveals Herself), all forms of sadhana, known and unknown, just occurred to her in the form of a lila (play) without any conscious effort on her part. Thus her Sadhana can not be slotted into a specific area, for to do so would mean that she was somehow limited to that area and her mastery was also limited. She welcomed and conversed with devotees of different religions from Shaivaite, Vaishnavs, Tantric, or from Islam, Christianity, Zoroastrianism. Everyone was welcome and she was equally at ease while giving guidance to all practitioners of different faiths. Even now, the Muslim population of Kheora still refer to her as "our own Ma". She taught how to live a God-centered life in the world and provided the living inspiration to enable thousands to aspire to this most noble ideal. She also advocated spiritual equality for women; for example, she opened up the sacred thread ritual, which had been performed by men only for centuries, to women, but only those who met the moral and personal requirements. Her style of teaching included jokes, songs and instructions on everyday life along with long discourses, silent meditation and recommended reading of scriptures. Father, there is little to tell." She spread her graceful hands in a deprecatory gesture. "My consciousness has never associated itself with this temporary body. Before I came on this earth, Father, I was the same. As a little girl, I was the same. I grew into womanhood, but still I was the same. When the family in which I had been born made arrangements to have this body married, I was the same... And, Father, in front of you now, I am the same. Ever afterward, though the dance of creation change around me in the hall of eternity, I shall be the same. The Publication Department of the Shree Shree Anandamayee Charitable Society in Kolkata regularly publishes her teaching in the periodical Anandavarta Quarterly. The Sri Sri Anandamayi Sangha in Haridwar organizes the annual Samyam Mahavrata congregation to devote a week to collective meditation, religious discourse and devotional music. ^ a b c d Hawley, John Stratton (2006). "Anandamayi Ma: God came as a Women". The life of Hinduism. Univ. of California Press. pp. 173–183. ISBN 0520249135. ^ Ananda Varta, Vol. 28, No. 4, p. 283. ^ Mother, as Seen by Her Devotees. Shree Shree Anandamayee Sangha. 1995. ^ Chaudhuri, Narayan (1986). That Compassionate Touch of Ma Anandamayee. Motilal Banarsidass. pp. 16–18, 24–26, 129–133. ISBN 978-81-208-0204-9. ^ a b c Lipski, Alexander (1993). Life and Teaching of Sri Anandamayi Ma. Motillal Benarsidass Publishers. p. 28. ^ a b c d e f Ghosh, Monoranjan (2012). "Anandamayi, Ma". In Islam, Sirajul; Jamal, Ahmed A. (eds.). Banglapedia: National Encyclopedia of Bangladesh (Second ed.). Asiatic Society of Bangladesh. ^ McDaniel, June (1989). The Madness of the Saints: Ecstatic Religion in Bengal. University of Chicago Press. p. 194. ISBN 978-0-226-55723-6. ^ In Hindu diksha, when the mind of the guru and the disciple become one, then we say that the disciple has been initiated by the guru. ^ Hallstrom, Lisa Lassell (1999). Mother of Bliss. Oxford University Press. p. 39. ISBN 0-19-511647-X. ^ Lipski, Alexander (1993). Life and Teaching of Sri Anandamayi Ma. Motillal Benarsidass Publishers. p. 66. ^ Hallstrom, Lisa Lassell (1999). Mother of Bliss. Oxford University Press. pp. 42–43. ISBN 0-19-511647-X. ^ Life History: Chronology of Mothers life Archived 21 April 2016 at the Wayback Machine Anandamayi Ma Ashram Official website. "Prime Minister Smt. Indira Gandhi arrives at noon, Ma's divine body given Maha Samadhi at about 1.30 pm near the previous site of an ancient Pipal tree, under which she used to sit on many occasions and give darshan." ^ Sharma, Arvind (1994). "Women in Hinduism". Todays Woman in World Religions. State University of New York Press. pp. 128–130. ISBN 0-7914-1687-9. ^ Hallstrom, Lisa Lassell (1999). "Anandamayi, Ma". Indian Religions: A Historical Reader of Spiritual Expression and Experience. Hurst & Company, London. p. 538. Banerjee, Shyamananda (1973). A Mystic Sage: Ma Anandamayi: Ma Anandamayi. s.n. Bhaiji (1975). Sad Vani: A Collection of the Teaching of Sri Anandamayi Ma. translated by Swami Atmananda. Shree Shree Anandamayee Charitable Society. Bhaiji. Matri Vani — From the Wisdom of Sri Anandamayi Ma. translated by Swami Atmananda. Chaudhuri, Narayan (1986). That Compassionate Touch of Ma Anandamayee. Delhi: Motilal Banarsidass. ISBN 81-208-0204-7. Datta, Amulya Kumar. In Association with Sri Ma Anandamayi. Fitzgerald, Joseph; Alexander Lipski (2007). The Essential Sri Anandamayi Ma: Life and Teaching of a 20th Century Indian Saint. World Wisdom. ISBN 978-1-933316-41-3. Ganguli, Anil. Anandamayi Ma the Mother Bliss-incarnate. Ganguly, Adwaita P (1996). Yuga-Avatar Sri Sri Ma Anandamayee and Universal Religion. VRC Publications. ISBN 81-87530-00-6. Giri, Gurupriya Ananda. Sri Ma Anandamayi. Joshi, Hari Ram (1999). Ma Anandamayi Lila, Memoirs of Hari Ram Joshi. Kolkata: Shree Shree Anandamayee Charitable Society. Kaviraj, Gopinath (1967). Mother as Seen by Her Devotees. Varanasi: Shree Shree Anandamayee Sangha. Lipski, Alexander (1983). Life and Teachings of Sri Anandamayi ma. Orient Book Distributors. Maschmann, Melita (2002). Encountering Bliss: My Journey Through India with Anandamayi Ma. trans. S.B. Shrotri. Delhi: Motilal Banarsidass. ISBN 81-208-1541-6. Mukerji, Bithika (1998). A Bird on the Wing — Life and Teachings of Sri Ma Anandamayi. Sri Satguru Publications. ISBN 81-7030-577-2. Mukerji, Bithika (2002). My Days with Sri Ma Anandamayi. India: Indica Books. ISBN 81-86569-27-8. Mukerji, Bithika (1970). From the Life of Sri Anandamayi Ma. India: Sri Sri Anandamayi Sangha, Varanasi. Ramananda, Swami (2002). Bliss Now: My Journey with Sri Anandamayi Ma. India: Select Books. ISBN 978-1-59079-019-9. Ray, J. Mother As Revealed To Me, Bhaiji. Yogananda, Paramhansa (1946). Autobiography of a Yogi. New York: Philosophical Library. Wikimedia Commons has media related to Sri Anandamayi Ma. The personal papers of Anandamayi are in the Andover-Harvard Theological Library at Harvard Divinity School in Cambridge, Massachusetts.